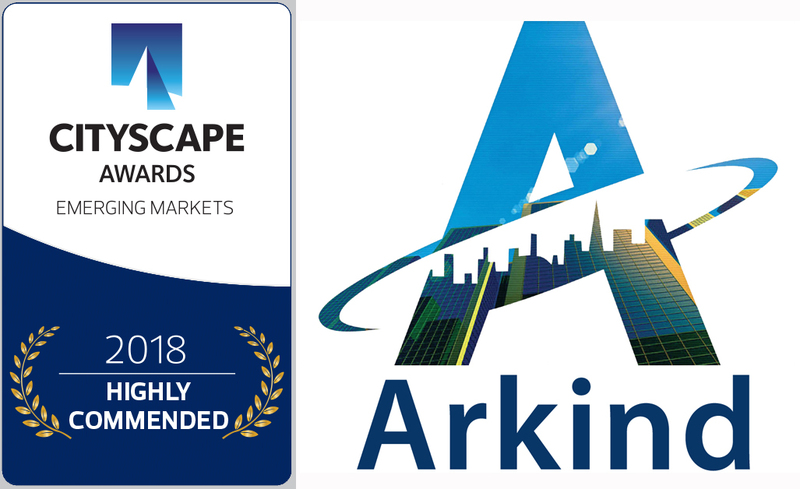 ARKIND’s DESIGN WINS HIGHLY COMMENDED STATUS AT CITYSCAPE GLOBAL AWARDS. ARKIND’s design for Tharakan’s Zephyr Homes has won the ‘Highly Commended’ in Cityscape Global Awards held in October 2018 as part of Cityscape Global- the largest Real Estate and Property event in the World. 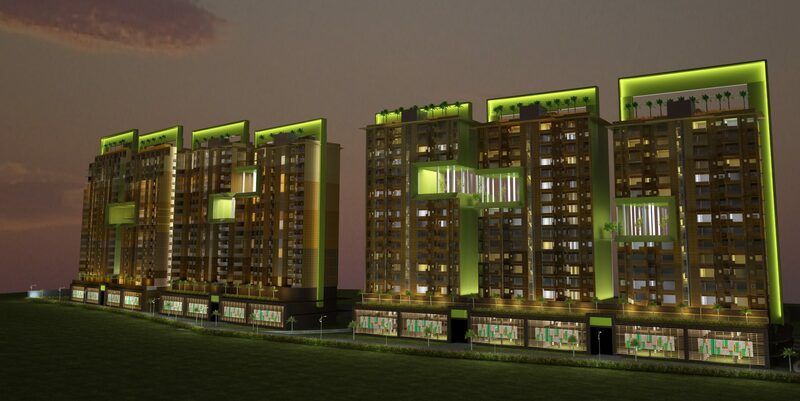 The project located in the Indian state of Kerala has won this recognition due to the unique design features, commercial model, environmental eco-cycle and facility management strategy implemented in the conceptualization and development of the project. 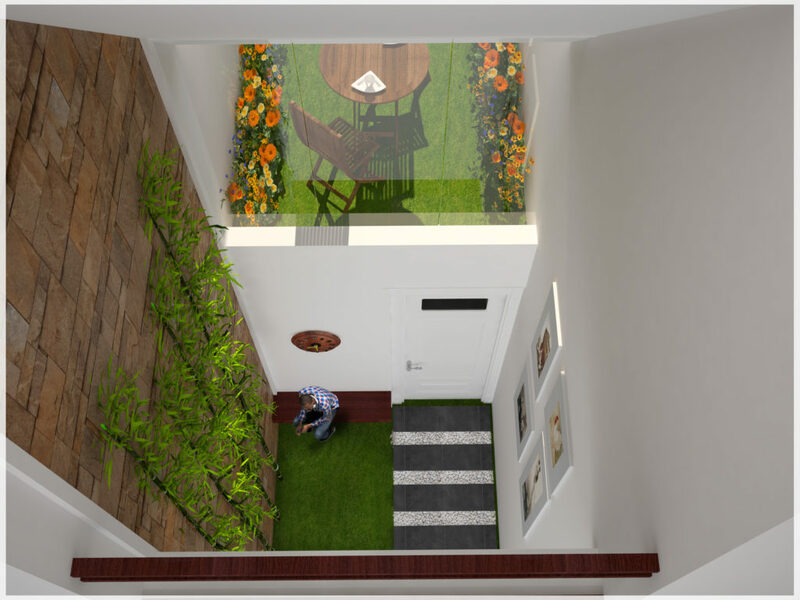 The concept of the design takes inspiration from the traditional Kerala courtyard house layouts and integrates the needs of togetherness as well as contemplation in retired life. The individual cottages are designed modular, yet convertible to three different layouts based on clientele. The layered planning of the development ensures that none of the existing natural forces or topography is disrupted. The North West Zephyr is funneled in and cooled by intercepting natural water flow at site converted to water features. 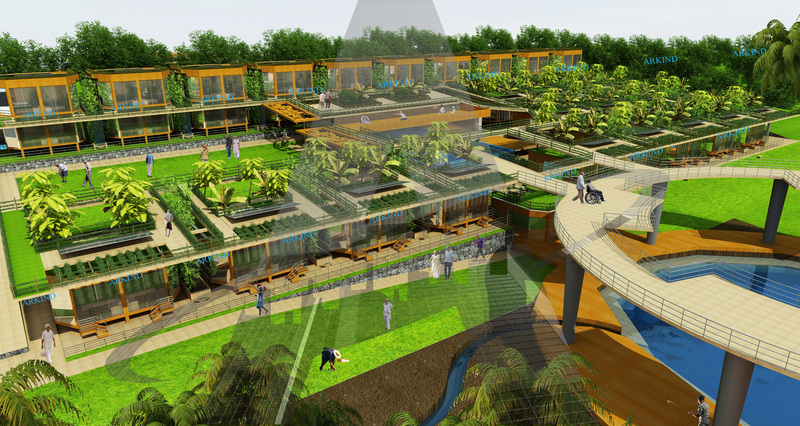 A self-sufficient lifestyle in created through ARKIND’s design of the facility with organic roof farming, skywalk, meditation spaces, community interaction, and ample group as well as solitary leisure facilities. ARKIND’s designs for various projects have won International recognition in the past, as well. This includes ‘Highly Commended’ awards in previous Cityscape Global Awards in the years 2015, 2012-13 and 2011-12 and nomination to the World Architecture Festival Awards, known as ‘Oscars of Architecture’ in the years 2015, 2014 and 2013, Plan Awards-Italy in the Tourism, Leisure-Led Development, Education, Resort, Environmental, Culture, Community categories. Built spaces have a major impact on the well being and disposition of people, just as much as the food they consume. Quality architectural design has the ability to affect even the most basic element ‘Air’ by improving air quality and thus health. For a moment, just imagine the scenarios of living ‘in nature’ without any built structure. Experiencing free flow of Air would be one of the most welcomed features of living ‘in nature’. Are our built spaces able to generate a similar free flow of air or do we sometimes create what could be termed ‘air lock spaces’ leading to poor air quality and ultimately mental and physical ill-health? Similarly, looking at urban spaces- are our building inter-spaces often acting as ‘air locks’, due to thoughtless juxtaposing of structures? We all talk of the importance of cross ventilation while planning functional spaces- but ‘in nature’ does air just flow in horizontal level only? For healthy living Architecture should simulate all positive forces of nature into built environment. Air should be able to flow in all dimensions. Creation of upward air draft acts as a great energy booster. Design has the power to create micro level temperature differential within built spaces, thus simulating natural air flow. Spatial volumes and landscape features can be effectively layered to generate passive pressure variations. The cumulative effect of these can be further enhanced through apt positioning and selection of softscape and waterscape. Management of thermal mass, creation of stack effect, use of features like wing walls and so on, can simulate desirable micro airflow. 5D and 6D design software can support modelling natural air flow within buildings and integrate the wind pattern of the region and topography around. Even in high rise developments where one would be constrained by space limitations, the placement of built masses in urban cityscape can simulate positive airflow. Unfortunately these aspects take a back seat in zoning or development control regulation in urban precincts. Thorough analysis of micro-climate of a region can give cues to improve air circulation even within organically developed urban regions. Considering the pollution rates and environmental deterioration in cities, it is highly important to conduct a study of the existing airflow paths and create a well studies airflow map for future developments. In spite of being the primary need of mankind, why does Architecture and Planning give least importance to create regulations to aid airflow and ensure the same for future? 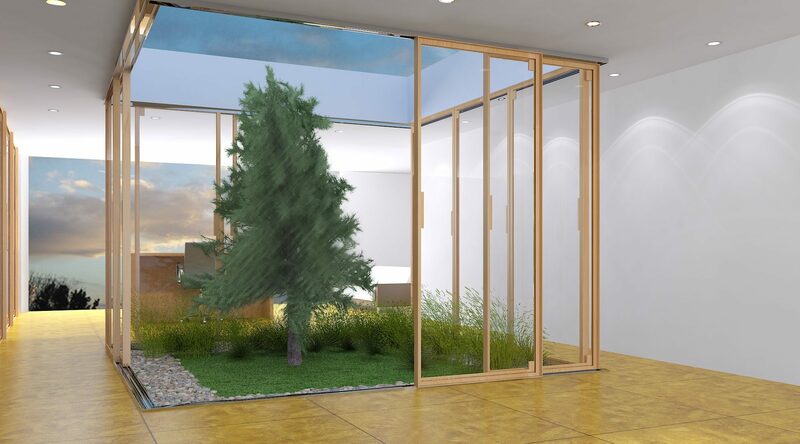 In addition to Air flow, the Air quality of spaces are influenced by finishes and materials used for construction, planting species selected, location of landscape elements, ease of cleaning and maintenance and many other factors. Air quality improvement becomes highly crucial in densely populated developments. Lack of space is often pointed out as an excuse to omit softscape or waterscape in such developments. But here again, why does one only look at horizontal surfaces to treat? The non-occupied vertical surfaces are available in multitudes to welcome the softscape and waterscape. Hence ‘improvement of air quality’ should be considered as a primary cardinal design parameter. Architecture is about delivering a happy and healthy lifestyle to the inhabitants of spaces. This includes the commonly understood perception of Architecture- which is visual aesthetics. However, there are equally or even more important aspects which are not respected enough. Our Principal Architect Ar. Deepa Mathai is a strong advocate of this cause of Architecture. We intend to share few of her thoughts in this regard over few of our upcoming blogs. “As John Keats expressed ‘A thing of beauty is a joy for ever’ and Joy ensures mental well being which translates to overall well being. If Architecture is beautiful it can impart joy. But the key factor is, how ‘Beauty’ is understood! Does beauty limit to visual impact of built spaces? Does a beautiful colour combination, form, shape or texture mean beauty? As in the case of human beings, beauty in Architecture should not also be just skin deep. It is sad to note that the public often define Architects as the ones who bring in visual beauty to spaces and structures. Yes, Architects do bring in visual beauty – but it does not just end there. A built structure is essentially one which gives living beings protection from undesirable nature’s forces. If not for certain forces of nature becoming ‘undesirable’ to modern lifestyle human kind would have lived freely in nature.